Love has inspired artists, poets and musicians for centuries. Join us at the Amherst Town Library on Thursday, February 7, 7:00-8:30PM and look at depictions of love, desire and heartache throughout the history of art. Enjoy images that capture the giddy joy and excitement of new romances, from first flirtations to sensual seductions and analyze scenes of break-ups and betrayal. This presentation includes works by well-known masters through the ages including Botticelli, Fragonard, Renoir and Chagall. 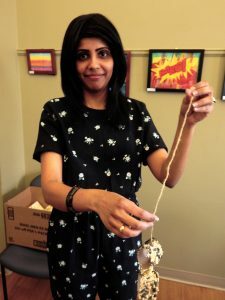 ignited a lifelong passion for helping others to connect through the arts. She is a NH native and has worked at some of the state’s most esteemed cultural institutions, including the League of New Hampshire Craftsmen, where she served as Executive Director, and the Currier Museum of Art, where she held the role of Senior Educator. Jane has taught Art History at the college level for more than a decade, most recently at the New Hampshire Institute of Art.